What do those two small words make you think and feel? Maybe a lot. Some of us are only reading this article because we found it on social media. Others just think of our kids and how deeply we wish they wouldn’t spend so much time behind a screen. Added to our personal experience and opinions, we can get caught in conversations among Christians about the role social media plays in the lives of the church and small group members. Does it bring people closer together? Or encourage comparison and division? No matter the ultimate resolution of the debate, the world we live in lives in a world of social media, and this tool can be used both for ill and for good. So how can your group maximize its social media use on Instagram, specifically, to build community? It might seem simple, but three easy actions can help add to Christ-centered unity and community (and even help you recruit new small group members). Instagram stories are almost becoming a social media platform in themselves. And some of their features can be used to strengthen community, get feedback, and invite others to join. Something as simple as snapping a picture of your latest Bible study book and asking people to reply if they’re interested in joining the study can help you build community. You can start a poll to survey your followers to see which topic they’d rather study as you prepare for what’s coming next in a group. You can take a boomerang of your group flipping through their Bible’s pages and post with the date and time of your group to spread the word to potential new members. You can use stories to post screen-shots of upcoming group events to invite others without your regular feed looking spamy. Hashtags are a # followed by text that, then, is searchable to others across the social media platform (e.g. #blessed). What if your small group created their own group hashtag? This could encourage your members to post about group which can spread the word to new members and keep members who’ve been missing from group in the loop about what’s happening. It can also be a way for the leaders to communicate encouragement to their members. If a leader is posting daily devotional content to the group hashtag, the content can be easily found, commented on, and liked, so that your group’s community continues to be strengthened. You can challenge your group members to post, even once a month, what God has been teaching them through group, what their favorite part is about group, things or people they’re thankful for within the group, and more. This will encourage the group members to stay invested in each other’s lives, but it can even be a wider encouragement to the church if they tag. By tagging the church in their individual posts, the shared image and description can be viewed by others. Other church members not in group can see and be encouraged or inspired, and people visiting the church and searching for the church’s social profiles can see what the life of actual members is like within the church community. It might seem simple, but simple encouragement to your group members to use stories, remember hashtags, and intentionally share and tag can make an impact not only in your group’s existing community but also as you look to recruit new members. What’s more? You can be intentional in who you follow, to be encouraged and inspired. Recently, the Groups Ministry team here at LifeWay has launched an Instagram page. 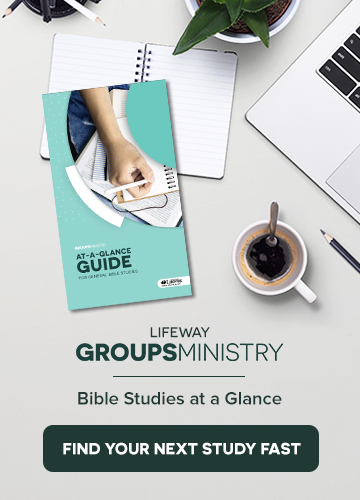 Check out the profile to stay up to date on the latest small group studies and to find other tips, tricks, and helpful content for all your small group needs. This article is an excerpt from the Bible study Counter Culture. Christianity and culture. Our faith and our world. Truth and love. How do we engage with our culture in a way that both shows the compassion and love of Jesus while also pointing back to the foundational truth of the Gospel? Often, instead of doing this well, we in our churches and Christian communities can engage with culture in ways that are not helpful to others or ourselves. For the sake of simplicity, let’s say we can have one of four possible responses in engaging our culture. WE CONFORM. We start compromising what we believe and the way we act in order to appeal to and appease the surrounding culture. We may even genuinely believe that doing so is both loving and strategic, hoping somehow people will be attracted to Jesus through a less offensive form of Christianity and will ultimately be saved. However, we have to realize that our goal isn’t to make following Jesus easier. We’ll look more closely … at the message of the gospel, but we’ve already seen that at its core, it’s necessarily countercultural and offensive to the human heart. WE CHECK OUT. The opposite extreme is to secede from culture, distancing ourselves so completely that we never have any interaction with the world around us. Again, the intent may seem honorable and sincere because we want to remove even an appearance of evil and the temptation of sin. But Jesus specifically prayed that His Father wouldn’t take His followers out of the world but protect them while they were sent into it (see John 17:15-16). The world around us desperately needs the life-changing power of the gospel. Forming an isolated, insulated subculture may feel countercultural, but it isn’t an appropriate response. Countering culture doesn’t mean withdrawing and isolating ourselves from culture. WE COMBAT. This approach is antagonistic and defensive. While the intent begins moving in the right direction, refusing to give in to or give up on the world around us, it misses the heart of Jesus. This response sees culture as an enemy to be defeated instead of people to be saved. Our desire mustn’t be to prove ourselves right or to force our way on the world around us. Instead, our goal is to show Christ to be true and worthy. Just as wrong as running away from our culture is driving people away from the church. Countering culture doesn’t mean attacking it. WE COUNTER. Countering culture means engaging culture with conviction and compassion. We stand firmly on the truth of God, empowered by the Spirit, to extend the love of Christ to a lost and dying world. Our desire isn’t to conquer but to redeem. It matters what we do, how we do it, and why we do it. A wrong response to culture is more than unhealthy or unhelpful. It’s potentially damning. Engaging our culture is literally a matter of life or death—eternal life or death. How do we move past these three harmful responses to culture and engage with “countering” like Jesus would? Platt dives deeper into the problem, the solution, and practical ways to start living in the remainder of his Bible study. Find out more at LifeWay.com/CounterCulture.